Product #21164 | SKU 583962 | 0.0 (no ratings yet) Thanks for your rating! 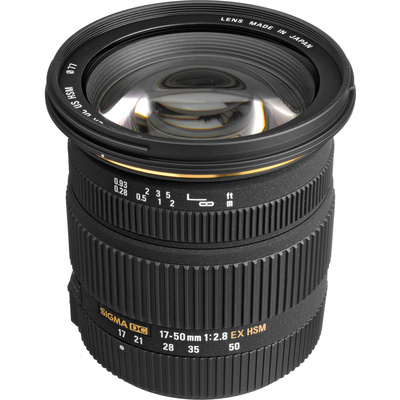 The Sigma 17-50mm f/2.8 EX DC HSM Zoom Lens for Sony DSLRs with APS-C Sensors is a versatile, lightweight, and compact lens designed specifically for Sony A-mount and Minolta digital SLR cameras with APS-C size sensors. The lens has a fast f/2.8 maximum aperture throughout the entire zoom range and its 35mm focal length equivalency is 25.5 - 75mm. It features a construction of 17 elements in 13 groups with glass that corrects for aberrations and multi-layered lens coating to minimise flare and ghosting. It produces high contrast, sharp images throughout the zoom range even at its maximum aperture. This Sigma 17-50mm f/2.8 lens does not contain the OS (Optical Stabilisation) designation because Sony Alpha DSLR's equip their camera bodies with image stabilisation technology. The DC designation on the barrel means that this is a special lens designed so that the image circle matches the smaller size (APS-C) of the image sensor of your digital SLR. Its specialised design gives this lens the ideal properties for APS-C digital cameras, including a compact size and lightweight construction.